Experienced Pet Sitter Available- Vet Tech! Want to connect with Jen? Hi there, my name is Jen, and I am a Registered Veterinary Technician. I offer Customized Pet Sitting Services in the greater Ottawa area & Gatineau. I care for Dogs, Cats, Horses, Birds & Small Animals! 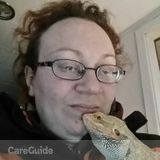 With over 15 years of Personal & Professional animal experience, I am experienced with a variety of animals, and am experienced with special needs pets. I am insured and bonded. I take great pride in my business and my animal care services. Please contact me to learn about customizing my services for your and your pets' needs! Looking to give some love to a furry friend!